Don't fix it. 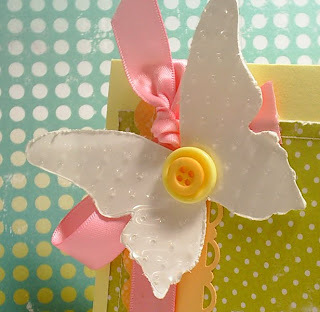 Although that simple little saying is full of grammatical errors, I still use it and apply it, such as the ribbon/button treatment and the dandelion image that I did in my card here. United Thread, the feature Etsy shop for Etsy Inspired Challenges, has some really neat hand drawn images, especially of bees and dandelions. The sketch is from CPS. 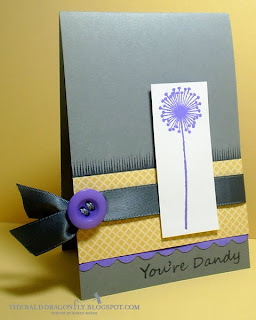 I've never tried grey, purple and yellow before on a card...I kind of like it! Do you ever find a moment in your life where you need to thank so many people for kind things they've done that you feel so blessed to have a reason to make so many "thank you" cards? I love that feeling! 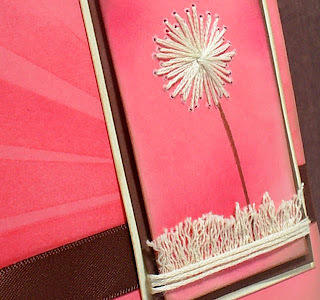 One of the current challenges over at Moxie Fab is Fun with Floss so I've replaced/stitched the whispy seed strands (?) 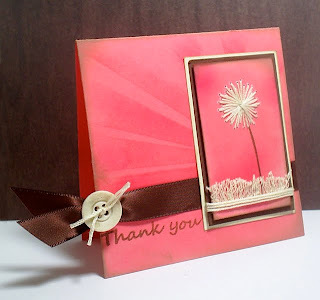 from the larger of two dandelions from the You're Dandy stamp set with ivory floss. I then deconstructed the strands and cut them short to create grass and wound the focal image three times with the same floss. Utilizing the Rule of Three, I carried the floss over to the ribbon/button combo. I punched a half circle out of the paper beneath the button so that the ribbon could be tied with floss closer to the card base. 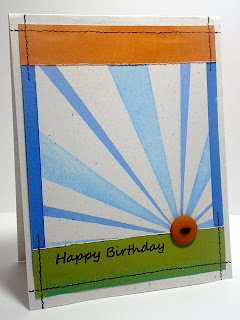 The background is stamped and lightly shaded with the rays from the same stamp set (ok, ok, I know you've seen them before, but I really LOVE these rays!). 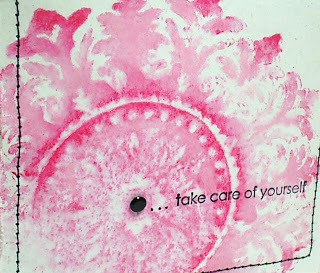 After reading many of Papercrafts Magazines, I was always tempted to try the "ink all edges" in the directions field, so I have done that on this card as well to soften the coral. 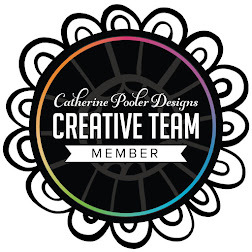 Thanks to the kind and talented Jessica from Recapturing Wonders, my weekend will be filled with trying out new and exciting product, as I was the humble recipient of her most awesome blog candy. What a wonderful surprise to receive this package after a trying day at work. 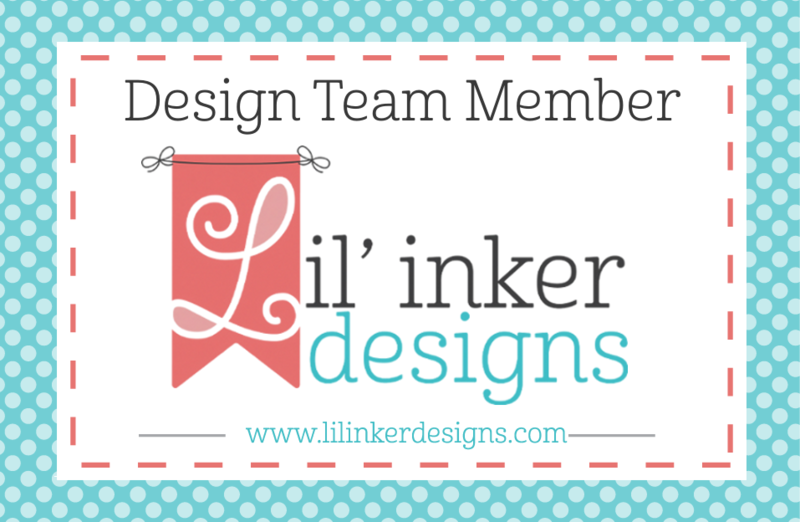 Her work and her blog are amazing! 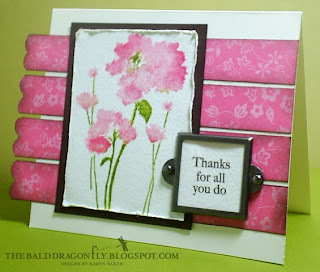 The sketch challenge over at Everything but the Kitchen Sink inspired me to create a card featuring the four seasons. I wanted to keep true to the sketch...simple, clean. 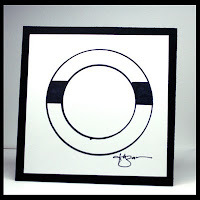 But also because of the sentiment, I wanted to create a soft, calm and serene feeling as well for the recipient. 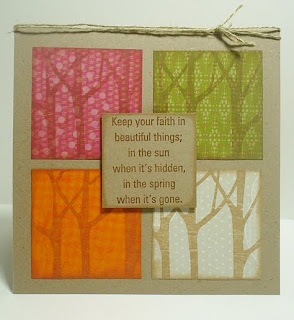 I started by choosing four patterned paper designs that reminded me of the seasons and then stamped them with the tree image and distressed the edges with the same chalk ink. 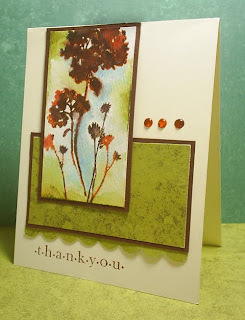 I added the linen thread on the top of the card for a bit of added interest, and the texture and color of it reminded me of the wood from the trees. Is it ok to really really like your own cards? Because I absolutely adore this card, it gives me goosebumps. I have to be honest, bright colors intimidate me, and bright colors in mass amounts terrify me. But, I still wanted to challenge myself (after all, I think that one of the reason Challenges are posted?) 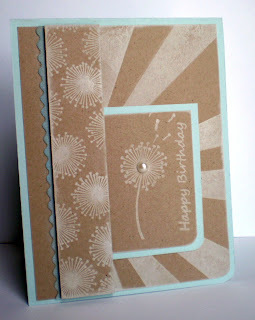 so I created this set of Birthday Cards for the Embellish Birthdays Color Challenge. The entries thus far are amazing and so bright, I envy them from afar. 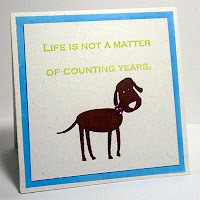 It's a Matter of Making Years Count. You Just become for Fun to Know and finally, Happy Belated Birthday. 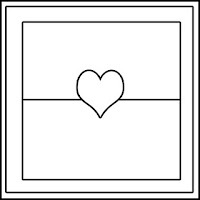 Its been a while since I've created a card with no intentions, a just because card. This isn't for any challenges or anybody's day specifically, it is just because I like this stamp set, because I bought some new chalk ink and wanted to try them out, and many more reasons! 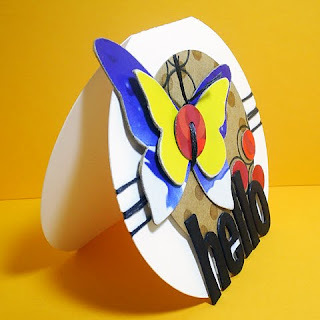 Cardvaarks is having a Wedding Card Challenge with the opportunity to get published, and since I missed the last deadline for the magazine I thought I should give it a shot! Here's my attempt at a classical style union with modern design. When you were little (or to this day...) did you ever take one of those dried out dandelions, blow, and watch all those little seeds float in the wind as you made your latest wish? I love this new set by Courtney from Practicing Creativity Designs for that reason, well...to be honest, a lot more reasons than can be mentioned (like being able to create your own patterns and textures with the graphic images) and wanted my first card to recreate that feeling of being able to wish for anything. 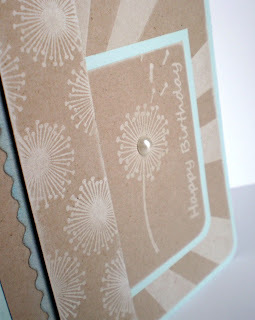 I also wanted it to be really soft and airy as well so I that is why I chose the white on kraft with a touch of sky blue. The layout of the card is from 2S4Y. 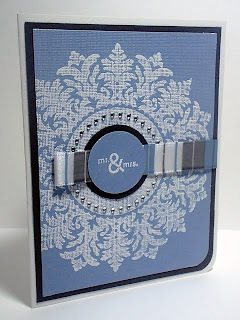 Supplies Used: SU Kraft and Sky Blue Cardstock, Practicing Creatity You're Dandy Stamp Set, SU White Craft Ink, Heidi Grace Velvet Stickers, Half Back Pearl Embellishment, Fiskars Corner Rounder Punch. 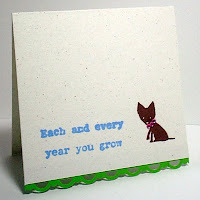 I made this card a while back but never posted it here on my blog. I love to watercolor, and I should try it out more often, it brings me back to the good ol' days of high school. Art Class to be exact, when I could create whatever and whenever I wanted... when the supplies came free... when I received recognition for hard work and determination. Anyways, back on track. To create this look I first spritzed some watercolor paper, added a base of blue and green inks with my aqua painter, stamped my image on the slightly wet paper, let it dry and then went back with the aqua painter and ink for some added depth. I let another CARDS submission deadline pass. 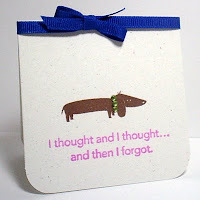 ***SIGH*** I'm really going to get enough courage to submit some of my creations some day, (pretty please let me find this courage before the August Deadline)... 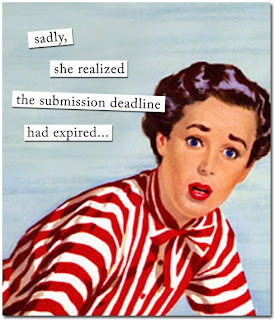 It's not for a lack of wanting to submit, really, it was a lack of time. 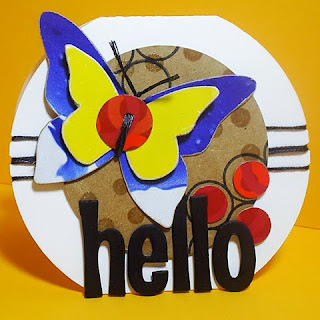 I wish I could have time to make something new, but the ticking clock just isn't in my favor. I thought I would post a card from some time ago that I favor over most other cards. 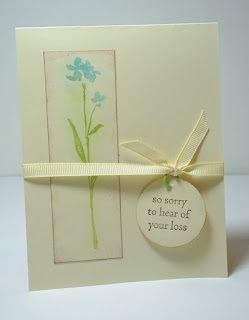 There are some slight changes I would make if I were to recreate this card, but overall the simplistic nature of it and the mostly tone on tone colors really fits with the Sympathy theme, I think. From the words of Oprah Winfry: Be thankful for what you have; you'll end up having more. If you concentrate on what you don't have, you never, ever have enough. 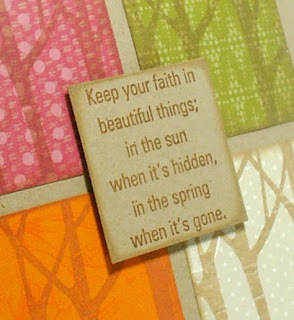 This sticker quote came from a pack by Creative Memories (and I'd like to think I should apply it to my stamping supply) and I based my card around it for the SRM Sticker Challenge (stickers and chipboard) and the Embellish Challenge (pink, turquoise, brown and ribbon). 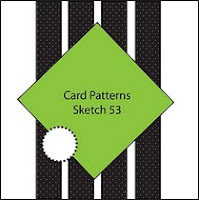 The basic layout of the sketch comes from CPS's sketch. As mentioned in a previous post, last weekend my dear uncle had his fiftieth birthday party. His sister, and my favorite aunt, wrapped his gift from my mother and her in newsprint and tied it with a lovely, wide satin black bow. He struggled to open the gift and GASP-he pulled out his pocket knife and cut this lovely ribbon! 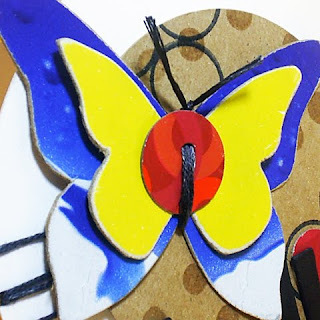 To all the crafty ladies' horror! My cousin and I quickly grabbed up the shreds from the paper pile and stashed it away. 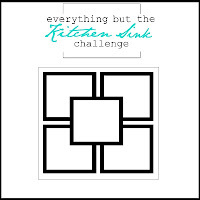 I knew that this coveted ribbon would be a perfect addition to a card for the Pals Paper Arts Color Challenge of Light and Dark Pink (with Black). 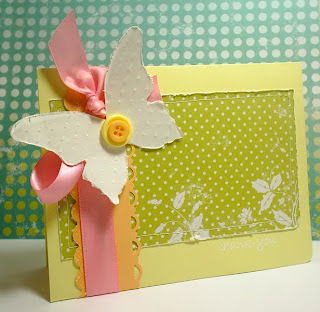 The look I intended for this card was Classical Chic, with a flair of vintage. 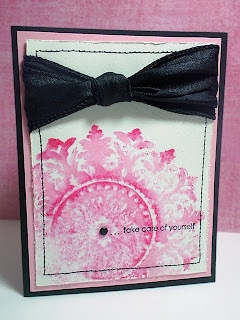 To counter balance the big, classy and bold ribbon, I took the background stamp, spritzed it with water, added watercolor crayons, spritzed again and stamped on Naturals White Paper. I finished with distressed edges and stitching-guess I just couldn't put the Sew Mini away. 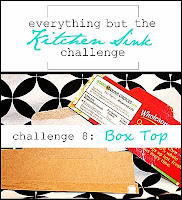 Oh how much fun it is to use all this "schtuff", technology and my brain to create! Graphic Design create! I'd love to know what you think of my new look (wouldn't it sometimes be wonderful if one could instantaneously change their physical attributes as well?!) Should I add what I do here or is that an assumption? Should I add my name somewhere? 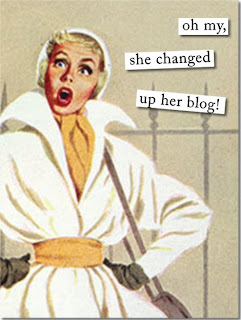 Blogspot is new to me so help and advise is welcome!